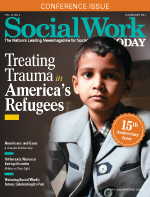 It is fitting that the cover story of our 15th anniversary issue is about social workers stepping up to meet the challenge of treating trauma among the nation's refugees. Our 15th anniversary feature article theme is about looking toward the future of social work, and there is nothing that reflects the future of this country and social work than acknowledging what a diverse nation we have become. As the country grows more diverse, however, there are some who would have us turn back the clock, close doors, build walls, and offer xenophobic slurs to those coming to this country imagining it to be the most welcoming place in the world. But leave it to social workers to show these refugees our welcoming ways. As our cover story will describe, refugees are individuals who have fled unspeakable atrocities in their homelands to seek better lives here. Their trauma does not need to be exacerbated by people who would rather have them return to lives of torture and brutality. Fear and hatred is part of what some refugees are facing here, but thankfully there are welcoming communities and clinicians who are helping ease their transition and heal the trauma of their journey to this country. Social workers across the country have developed culturally sensitive mental health treatment tools, but they still face challenges of policies that prioritize employment over health care, especially behavioral health care for refugees who so badly need trauma treatment. There are other barriers as well in mental health treatment among refugees—cultural, linguistic, financial, and logistic barriers. But there are also many innovative care delivery approaches that are making a difference in the lives of refugees, which our cover story explores. Our 15th anniversary issue feature includes essays from our editorial advisors that look to the future of the social work profession having reflected on its rich history. The essays are thoughtful, subjective, opinionated, maybe a bit controversial, but always interesting, and we hope you will enjoy them. Thanks to our loyal readers and to all social workers everywhere!